It was discovered deep below the surface of the earth, and thought to be a perfectly mummified creature. When rehydrated, it proved to be still alive after being dormant for potentially millions of years. Its body is able to withstand both extremely frigid temperatures, and sweltering heat. Due to it being unlike any other species, some theorize that it could be from another planet; able to survive the vacuum of space itself. It appears to rely on the various glowing sensory organs on its body to "see" around it, and its mouth appears to be the sole orifice. Though it's been studied eating various mosses, no one has seen it......dispose of the waste, and may possibly burn it off via the same glowing spots. Ability: Hardiness - The Pokemon can not be Burned or Frozen. An entry for 's fakemon challenge, this one is under the theme of something small, but built up on a massive scale. In this case, we have the tardigrade, aka the "water bear"; a microscopic critter that is downright hardy, being able to survive being frozen to near absolute-zero, boiling water, and even outer space itself. I was not making any of that up for its 'dex entry; these guys would kick our asses if they were anywhere near a threatening size. Maybe not so bad if they were like the Volus from the Mass Effect games; those guys are kinda cuddly looking. 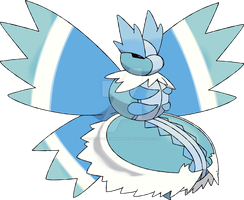 Anyway, I like to thing of this guy as a semi-legendary, sort of along the likes of Heatran. Where can you find this Pokémon? Answer: Anywhere you want. 'Cuz it can live anywhere.